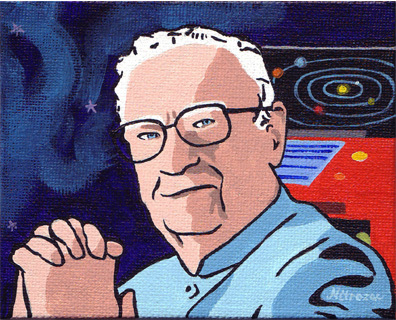 Click here to bid on "Arthur C. Clarke". 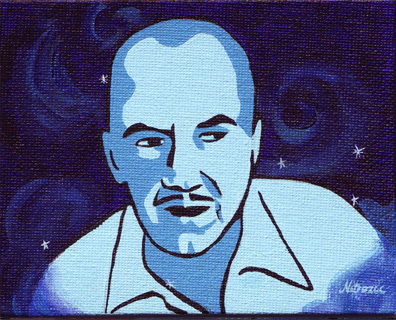 Click here to bid on "Robert A. Heinlein". 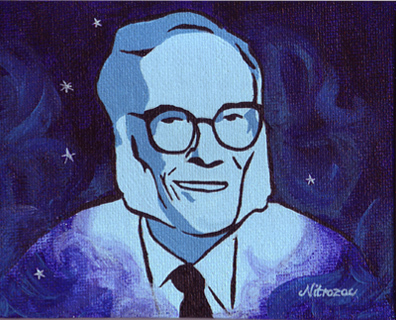 Click here to bid on "Isaac Asimov". All three paintings were sold at auction! That's folks! Robert A. Heinlein, Arthur C. Clarke, and Isaac Asimov are known as the "Big Three" of Science Fiction. Snaggy and I have featured them in our comic, AY2K. I painted them as they appeared in the comic. Heinlein and Asimov are painted in ghostly blue with "Sci-Fi" swirls around them to reflect their existence beyond this life. Arthur C. Clarke, who is still alive, is painted in realistic colors (with an Aardvark computer in the background). The three paintings make a triptych (although I am selling them separately). I enjoy painting tributes to iconic geeks, and The Big Three have greatly inspired geeks for many years and provided non-geeks with excellent entertainment. They brought the notions of space travel, robots, communication satellites, and so much more to life, I really can't imagine the world without their ideas! When I look at these paintings it brings me a sense of inspiration, because they are artists who had originality in thoughts and work. I believe that they have changed the world for the better, and what I admire is that they changed the world with their ideas, not products. That is an extremely rare and great acheivement. Details: "Robert A. Heinlein", "Arthur C. Clarke", and "Isaac Asimov", is Nitrozac's 34th, 35th, and 36th paintngs of her Painting Blog. They are all acrylic paintings, on 4 x 5 inch canvas panel. The paintings will be dry and ready to ship after the auction ends. The back of the paintings will contain the title, the date painted, Nitrozac's signature, and a fingerprint for authenticity. Shipping for each painting is extra... to the US and Canada it is 8 dollars, to other locations, 15 dollars. Please Note: Canadians will be charged any appropriate taxes (GST) and PST if the bidder is from British Columbia, in addition to the sale price.